Hyperbaric Oxygen Therapy…the magic of breathing Oxygen. In honour of Movember – Gro A Mo to Save A Bro – thought we would do something very different. Movember is a month dedicated to bringing attention to mens health issues, with greatest emphasis on prostate cancer, testicular cancer, and men’s mental health. Prostate cancer strikes approximately 1/6 men in North America. Radiation therapy – yes it can save lives – however it can often have some very difficult side effects – this is just one of the many uses of our topic today – Hyperbaric Oxygen Therapy. Hyperbaric oxygen therapy involves breathing pure oxygen in a pressurized chamber. The chamber is transparent, and for anyone who fears an MRI, have no fear here. Hyperbaric oxygen therapy is a well-established treatment for many medical conditions, including decompression sickness (a potential risk of scuba diving), serious infections, osteomyelitis, post surgical wounds not healing, thermal burns, damage from an edema, wounds that won’t heal as a result of diabetes or radiation injury. 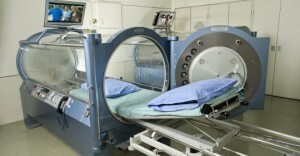 The number of applicable situations for HBOT is increasing all enabling oxygen to reach the tissues after sickness or injury, preventing necrosis – tissue death. It is also being used to reduce risk of surgical complications for smokers – again – one of the many devastating effects of smoking is poor oxygenation within the body. In a hyperbaric oxygen therapy chamber, the air pressure is increased to three times higher than normal air pressure, allowing the lungs to gather more oxygen than would be possible breathing pure oxygen at normal air pressure. The blood transports the oxygen throughout the body, helping fight bacteria and stimulate the release of growth factors and stem cells, which promote healing. There is also evidence that suggests HBOT can stimulate new blood vessel & capillary growth that have been damaged, due injury or other treatment procedures. Dr. Anton Marinov is the medical director of the Rouge Valley Hyperbaric Medical Centre, right here in our very beautiful Toronto. . Dr. Marinov completed a B.Sc. in immunology at the University of Toronto and his medical degree at Queen’s University. He obtained his royal college fellowship in anesthesia in 2008 and subspecialty training in Interventional Chronic Pain Management at the University of Toronto. Dr. Marinov has worked in the field of hyperbaric medicine for over 10 years and has been actively involved in research and education. I believe that is among the so much important info for me. And i’m glad studying your article. But wanna remark on few common things, The website style is great, the articles is actually excellent : D.
This is an great website over here. I think I will visit your site more if you post more of the information. Thanks a lot for publishing the information. An informative web site report specifically there pal ! Cheers for it !